Rarely do you come across a completely new account of the breakthrough at Chickamauga, let alone a new view from Rosecrans’s Headquarters. But thanks to Senator James W. Nesmith of Oregon, we have one. Senator Nesmith was a War Democrat, elected as the Junior Senator from Oregon in 1860, a year after Oregon became a state. 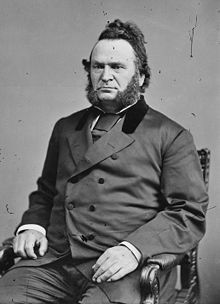 He was asked to run in order to replace Joseph Lane, who was elected to a special term in 1859, but who declined to stand for re-election in 1860, choosing instead to run as John C. Breckinridge’s running mate as the Democratic party fractured that election cycle. Lane’s pro-slavery, pro-secession stance destroyed his political career in Oregon, a free state with strong abolition sentiments and an abhorrence of secession. Oregon Democrats, afraid of a Republican sweep, asked Nesmith to step in. He won. Nesmith, despite his Democratic affiliation, came to be a steady supporter of the Lincoln administration. He served on the military affairs committee, was asked by Stanton to help provide oversight of the Union draft to make sure it was fairly administered, and undertook frequent inspection trips for the administration. He was the only Senate Democrat to vote for the 13th Amendment. In early September, 1863, Nesmith traveled to join General Rosecrans and the Army of the Cumberland as they campaigned around Chattanooga. He reached Bridgeport on September 15th, in company with Colonel Henry C. Hodges, chief quartermaster for the Department of the Cumberland, and proceeded on to join Rosecrans. Nesmith met with Gordon Granger at Rossville on September 17th – Granger was an old friend, having served in Oregon with the US Mounted Rifles in the 1850s – and then moved on to Rosecrans’s headquarters at Crawfish Spring on the 18th. He and Colonel Hodges remained with Rosecrans until midday on September 20th, when they became separated from the army commander by the Confederate breakthrough. Nesmith’s mission is still a bit unclear to me. This seems to be an official trip, and in discussing the topic with Jim Odgen at Chickamauga, Jim suggested that Nesmith’s inspection might be connected to the ongoing issue of supply. Rosecrans not shy about sharing his logistical difficulties during this campaign, especially with regard to the huge demand for horses and mules. The War Department in Washington tended to downplay those complaints, regarding Rosecrans as prone to exaggeration (to be polite about it.) In later weeks Union Quartermaster General Montgomery C. Meigs would come to Chattanooga on just such a mission, whereupon Meigs immediately informed the War Department that Rosecrans was not embellishing a thing. However, there is very little paper trail to follow. Nesmith is only mentioned a couple of times in passing in the Official Records. There is a note from Granger introducing “his good friend” the Senator to General Rosecrans, and General Hazen mentions him briefly as a witness to a dressing-down given to Hazen by Rosecrans on the night of September 18th. That episode affronted Hazen, and he mentioned Nesmith as a witness in a later effort to clear the matter up. If not for that mention by Hazen, I am not sure I would have tumbled to the fact that Nesmith was present during the battle. But that passing mention got me to wondering. Nesmith described his trip both privately, in letters home to his family, and publically, in a lengthy epistle to the Oregon Statesman, under the pen name of Tillicum. In a private letter, Nesmith noted that “from Bridgeport to Chattanooga is a terrible rough mountainous country, [with] as bad a road as I ever traveled over in Oregon.” Interestingly enough, he describes the dust as “shoe mouth deep,” a phrase that re-occurs often in descriptions of the time, including by Confederates. I wonder how common that phrase was in regular usage. After that, Nesmith rode west out the Dry Valley Road, through McFarland’s Gap, and into Rossville. Along the way he would only say that he “saw enough of cowardice and imbecility to disgust any . . . man.” Along the way, he must have encountered Alexander McDowell McCook, who did not leave a favorable impression. “McCook ought to try some other business besides fighting,” Nesmith confided to his cousin. Was McCook counted among the “cowards and imbeciles” who raised Nesmith’s ire? The Senator doesn’t say. When he returned to Washington in early November, however, his opinions concerning the late disaster and the state of affairs at Chattanooga were much sought after. Publically, he reassured everyone that Chattanooga was a splendid position, that the troops – now under Grant and George Thomas – were still full of fight and in fine spirits, and that the Rebels, if they dared attack, would be soundly defeated. I have not found evidence of what he told Lincoln or other members of the government in private, but I suspect it wasn’t much good about Alexander McDowell McCook. Nesmith’s account isn’t going to set our interpretation of what happened at Chickamauga on its head. But it is a fascinating new window into what was happening atop that knoll at just about noon, Sunday, September 20th, 1863.